Rev. 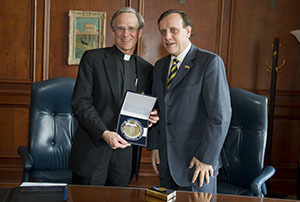 John I. Jenkins, C.S.C., president of the University of Notre Dame, and Ignacio Sánchez Díaz, president of the Pontifical Catholic University of Chile (PUC), have signed a memorandum of understanding to strengthen scholarly engagement between their institutions, and to advance their mutual ambition to rank among the world’s greatest research universities. The agreement, signed by both presidents in a ceremony in Notre Dame’s Main Building Monday (April 29), will establish an exchange program in which faculty, doctoral students and university representatives from Notre Dame will visit, work, study and collaborate with PUC colleagues over the next three years. Supported by gifts to Notre Dame and the PUC from Chilean benefactor Andrónico Luksic, the program will formalize and expand upon a long-standing relationship between the two universities and will further enhance the opportunities that both institutions have to engage their faculty and students internationally. Even now, the PUC is host to Notre Dame’s undergraduate study abroad program in Santiago, Chile and the two universities’ engineering and law schools collaborate in a variety of research projects. “We are enthusiastic to build on our existing agreements as well as create a whole range of new opportunities for the mutual benefit of both universities,” said J. Nicholas Entrikin, vice president and associate provost for internationalization at Notre Dame. “This gift to Notre Dame will result in even greater faculty and graduate student exchange and collaboration with Chile. It is a remarkable opportunity for both PUC and Notre Dame,” said Steve Reifenberg, executive director of Notre Dame’s Kellogg Institute for International Studies. The Chilean delegation visited Notre Dame through the coordination of Notre Dame International and the Kellogg Institute. Originally published by Michael O. Garvey at news.nd.edu on April 30, 2013.